One potential drawback of obfuscation is that debugging and troubleshooting obfuscated applications can be difficult due to name mangling. Dotfuscator addresses this drawback by providing an integrated tool that allows you to use your output mapping files to recover the original symbols from obfuscated stack traces. This can be opened in the Dotfuscator UI by going to the Tools menu and selecting Decode Obfuscated Stack Trace. Unhandled Exception: System.ApplicationException: A bad thing happened! Some methods in the obfuscated stack trace might be ambiguous; that is, due to the use of Overload Induction, there might be more than one matching un-obfuscated method. In these cases, the tool displays all the possibilities. 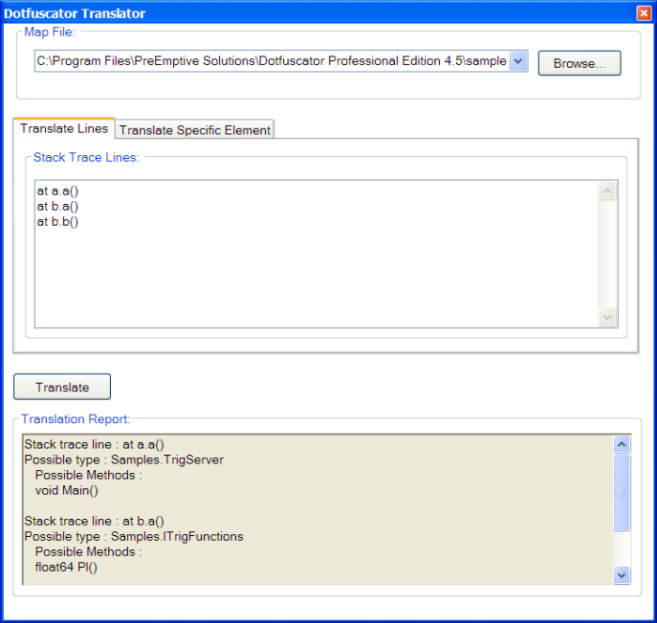 If you just want to look up a specific type or method by name, click the Translate Specific Element tab. You will see a screen that will allow you to type in the obfuscated names of the specific items you want to translate. To look up just a type, fill in the Type Name text box and click Translate. To look up a method, fill in the Type Name and Method Name text boxes. 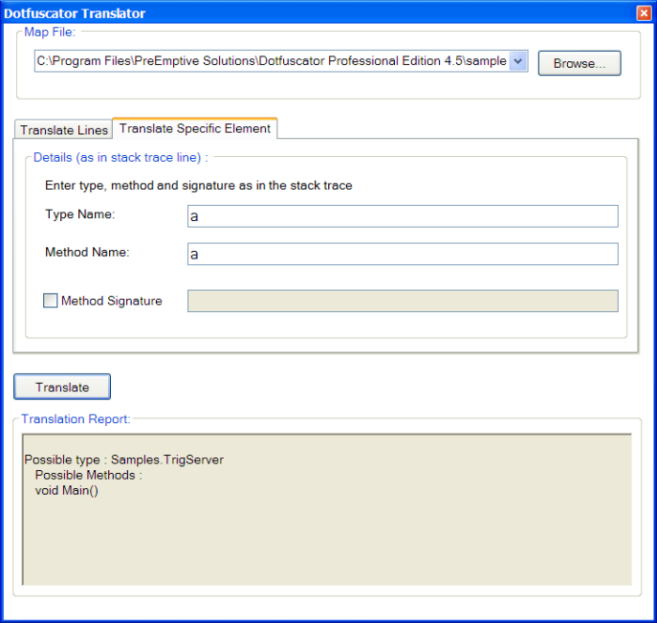 You can optionally provide a signature by checking the Method Signature check box and filling in the signature in the adjacent text box. The signature must be as it would appear in a stack trace.